My kitchen is full of green tomatoes, rescued from the greenhouse just ahead of an attack of blight. Sadly, we’re not very creative with the way we use them in this country. My mother’s chutney recipe is the best I’ve eaten but there are only so many cheese and chutney sarnies and cold cuts you can eat in a year. So I’ve been looking further afield for inspiration. 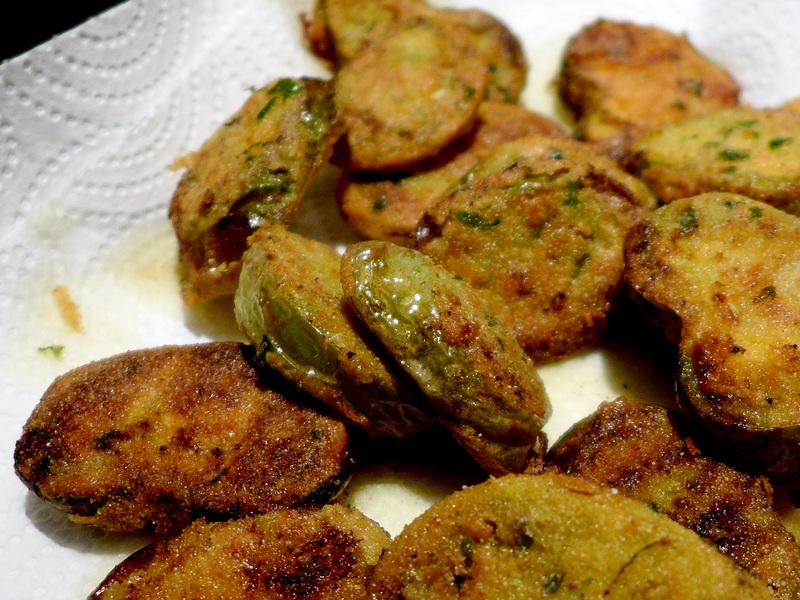 Fried green tomatoes are terrific, one of the great culinary inventions of the American south, especially with a stinging garlic mayo or a dollop of harissa. Joy of Cooking’s version, with a cornmeal crust and plenty of thyme, parsley and paprika, is very good. If you don’t have the book there’s a version here. Eat while watching Fried Green Tomatoes At The Whistlestop Cafe, a film with one of the best revenge lines ever (“I’m older and I have better insurance”), some meaty roles for women and, in an unexpected and rather gruesome way, for one of the male protagonists. 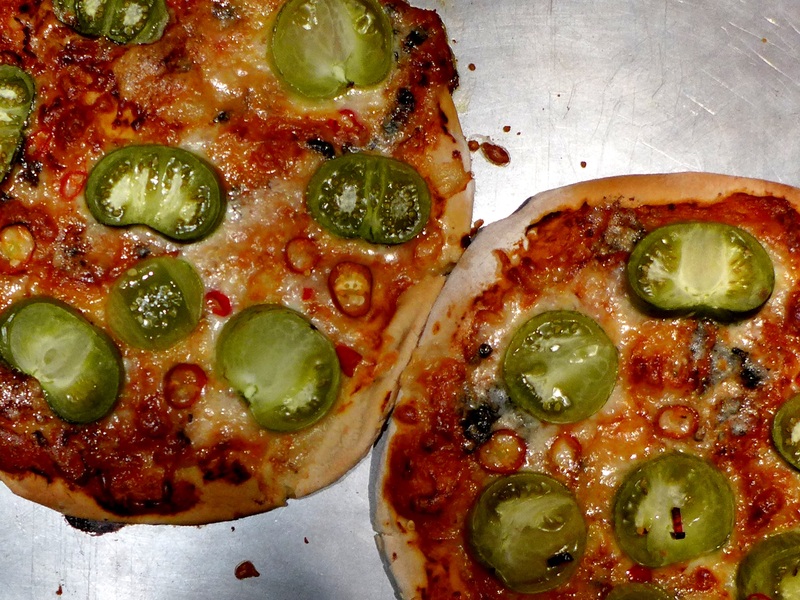 Switching back to Europe, green tomatoes are also good as a pizza topping: try the usual tomato sauce and grated mozzarella, topped with sliced green tomatoes and a good scatter of fresh chilli. 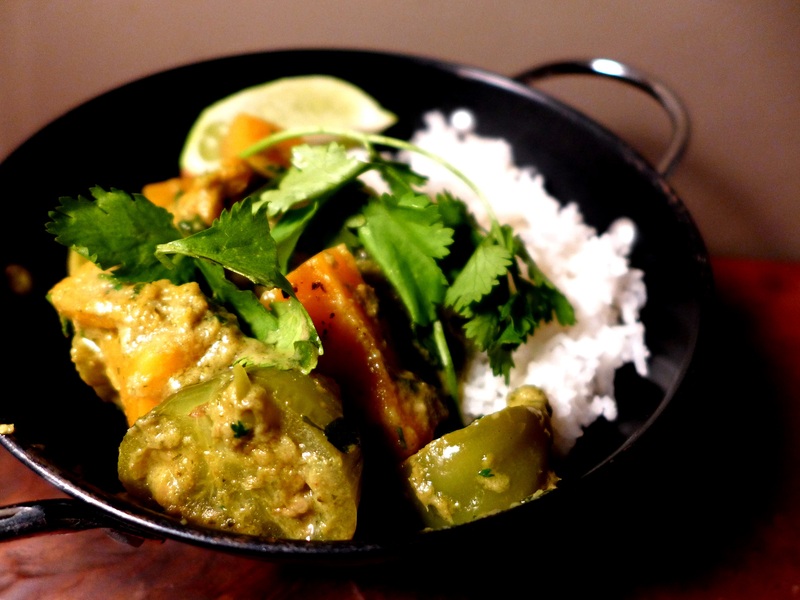 I think my current favourite, though, is this aromatic Thai-style veggie curry. The lemony flavour of the green tomatoes works so well with the aromatic, creamy sauce. I’ve added sweet, earthy butternut squash to balance the citrusy flavours, but sweet potato would work too. Or just go with the tomatoes. As ever, the choice is yours. Pre-heat the oven to 200C/400F/ Gas Mark 6. 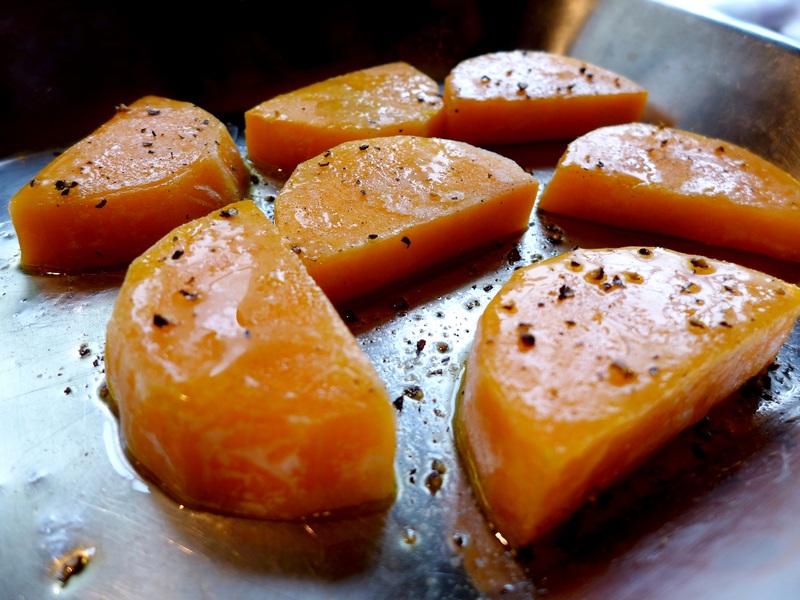 Peel the squash, cut into chunks, drizzle with oil and season with salt and pepper. Cook in the oven for 15- 20 minutes until just tender, then remove and set aside. Halve or quarter the tomatoes, depending on size, and put to one side. Peel the garlic, shallots and ginger. Remove the tough outer leaves of the lemongrass and discard. De-seed the chillies if you like, or leave them in. 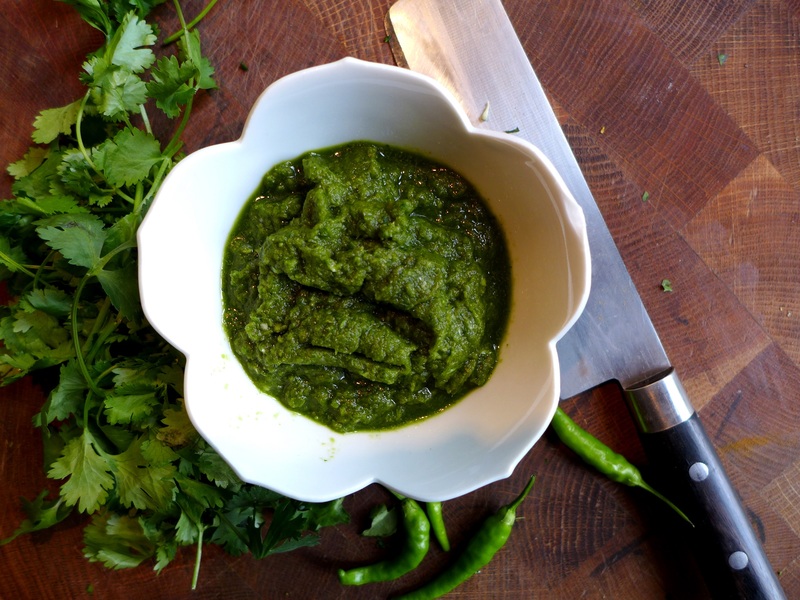 Chop everything finely and add to a food processor along with the cumin and half of the coriander. Whizz until everything is very finely chopped, then add the fish sauce and process again. Heat a tablespoon of oil in a pan on a low to medium heat and cook the paste for five or six minutes, stirring occasionally. Pour in the coconut milk, then add the boiling water. Sprinkle in the bouillon powder and stir. Gently bring to a boil, then reduce to heat and simmer for 10 minutes until slightly reduced and thickened. Add the tomatoes and cook gently until they are tender but still have some bite … you want them to hold their shape.Fold in the chunks of butternut squash and cook gently until the sauce amalgamates nicely. Stir in the rest of the coriander, roughly chopped, saving a few sprigs for garnish. 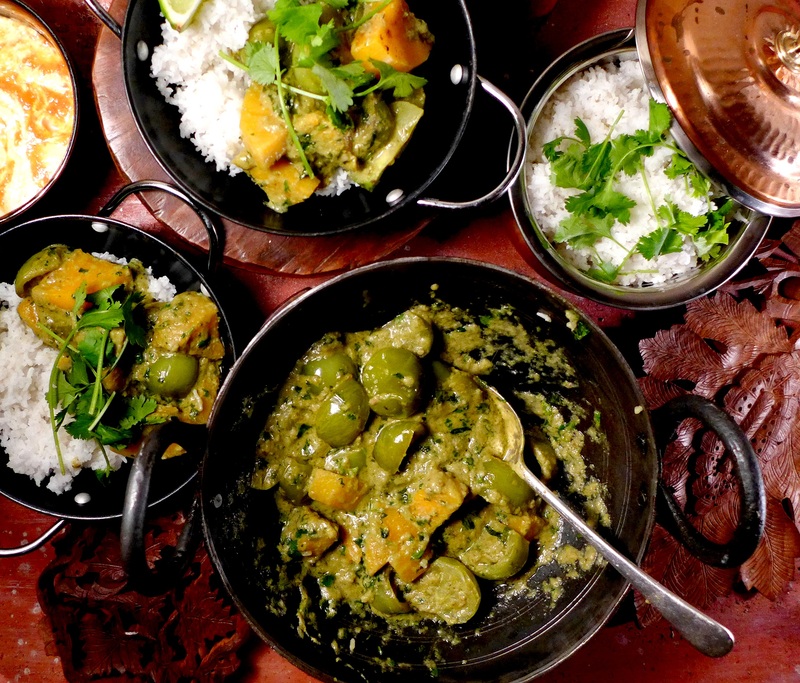 Serve with steamed rice and lime wedges, and perhaps a tomato and chilli raita. 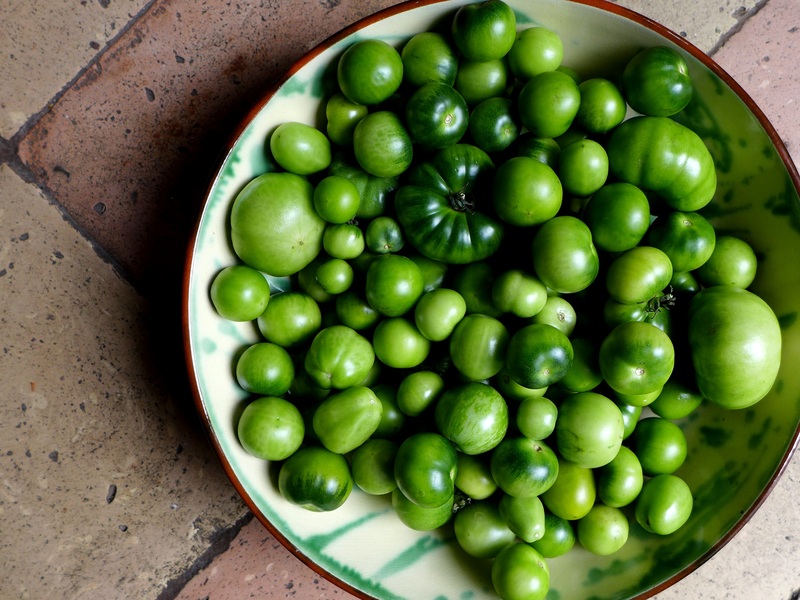 This entry was posted in In the garden, Mains, Vegetarian and tagged fried green tomatoes, green tomato chutney, green tomato curry, green tomato recipes, pizza with green tomatoes by Linda Duffin. Bookmark the permalink. My family argues over jars of green tomato pickles made to my Mum’s recipe, there never seems to be enough to last a year. I love fried green tomatoes, the movie and to eat. I’d never have thought to make a Thai green curry with them, very creative..